It’s been pretty quiet around these parts, so if you’ve been wondering where I’ve been and what I’ve been up to, well… I moved to Portugal! Just over a month ago I packed up three suitcases, one dog, and my dear friend, Sophia (expert handler), and set off for the San Diego airport at 4 am with final destination, Lisbon, Portugal. To tell you a complete tale of how I got here would require a novella-length explanation, so I will spare you all that, but I’ll share some highlights—and answer the top question I’ve been getting from friends, subscribers, and acquaintances. First, my dog Milo and I are well. Tired and a bit overwhelmed, but we are fine. Our new neighborhood has everything we need. It’s louder and more bustling than our old community, but it’s unfair to compare a pleasant and very tidy San Diego neighborhood to a traditional Portuguese town (we are across the river from Lisbon). Getting here, deciding what to take, getting Milo’s papers in order, selling my home, liquidating all my belongings (I still need to sell my van—hit me up if interested), and wrapping up my life in the States was no small feat. I did it with the help of Sophia, who flew in a few days before departure and accompanied me on the journey. It was great to have her support—she knows me and my, um, quirks, well—and she and my dog are crazy about each other. Her presence smoothed the transition. Shortly after she departed, my friend, Andrew, arrived from the U.K. with his dog, Dougal, in tow. He was also tremendous support, and it was a comfort to have them here. But now I’m alone, trying to make sense of the daily things in a language I don’t speak. You know all those contracts and emails you get when you set up utilities and cell phone and Internet? Yes, those—in Portuguese. All the basic tasks take three times longer. I need to remind myself, several times a day, to practice self-compassion. For the most part, I’ve been good (or become good) at whatever I set out to do. Not so with being a new immigrant (I don’t like or use the term expat). If I don’t check my rabid self-critic, I slip into a downward spiral lamenting how much I’m failing, and how stupid I am. Just typing that out loud feels pretty awful. I’ve come up with a mantra for this new chapter of my life (and it’s probably a good one for the rest of my life): baby steps, beginner’s mind, day by day. Feel free to use or adapt it—because we can all be a bit kinder to ourselves (and one another). 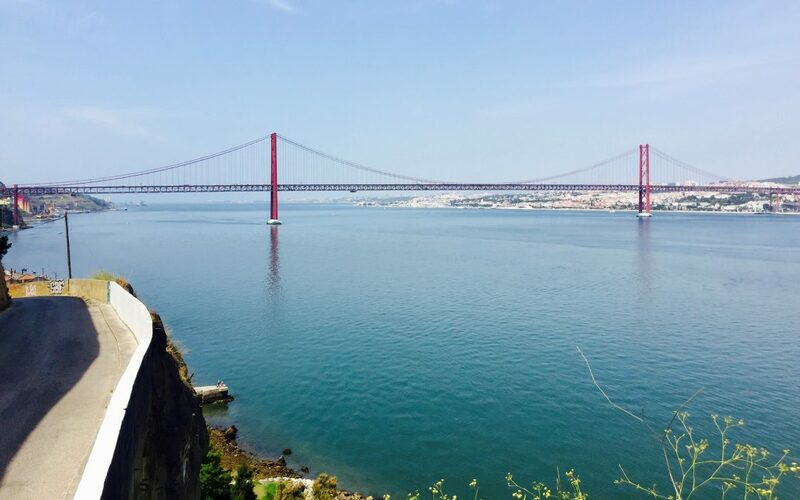 Now, the most common question/comment: Am I having (You must be having) a ton of fun/adventure and exploring Lisbon? No, I am not (see above and below). I’m learning how to live here, as a resident, not a visitor. With everything taking so much longer than it usually would back in my comfort one (laundry, grocery shopping, sourcing and buying furniture, etc.) I haven’t made the time, nor have I had the impetus, to explore. I have been to Lisbon a few times with Andrew, and on my own, but mostly I do laundry or some other pedestrian task, and then I feel like I need a nap. Exploration will come, be patient (I tell myself). So, this is just the start of an experiment. An experiment in learning how to live untethered to the touchstones, daily routines, and people back in San Diego. I just need to remember that I don’t need to have it all figured out in the first month or two. I have the rest of my life to get good at life—however long I might have. In my next post I will attempt to share why I moved to Portugal—and why Portugal. If you want to stay connected on a regular basis with this Portugal Project of mine, I gave in and created a new Instagram account. There I aim to tell the whole truth about being a new immigrant (see especially my first post, the one with the cats in the window, and the one with my face where I discuss my uniform and anxiety). Let me know in the comments, below, if you have any questions about this move or the process, or anything related. I’ll do my best to share what I know! I’m excited to follow along! I totally understand the “trying to make sense of the daily things in a language I don’t speak” part. We moved to Ensenada for a year in 2012. Even though I spoke Spanish, I was lost when I was setting up utilities. There were so many terms and words I didn’t know. I felt like my brain didn’t work. It does take a while. Thanks for stopping by 🙂 I remember when you made that move–wow, 2012? Where does the time go? Yes, I feel like a 3-year-old, here. A humbling place for a writer with a knack for language (apparently a knack for English only, so far!). Shanna thank you for sharing this with me. I hope to do the same journey from San Diego by the end of 2019. I would love to connect with you on a regular basis as well. Awesome article. I hope I can meet you and you doggie when I come to visit! Hi Karen! Thanks for dropping by 🙂 Yes, do stay in touch and when you come to Portugal give me a head’s up and will plan a coffee date!